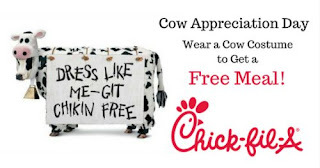 Freedom Rockz: Free Entree @ Chick-fil-A! Cow Appreciation Day®! Free Entree @ Chick-fil-A! Cow Appreciation Day®! Just wear any Cow apparel to your local restaurant & get a free entree on July 11th, 2017 from restaurant open til close. Click the link below to get the details.